When the elderly Woody Grant receives a notice from a sweepstakes he becomes determined to reach Lincoln, Nebraska to claim his prize. His son, David agrees to the journey, which includes a stop to Woody’s hometown. 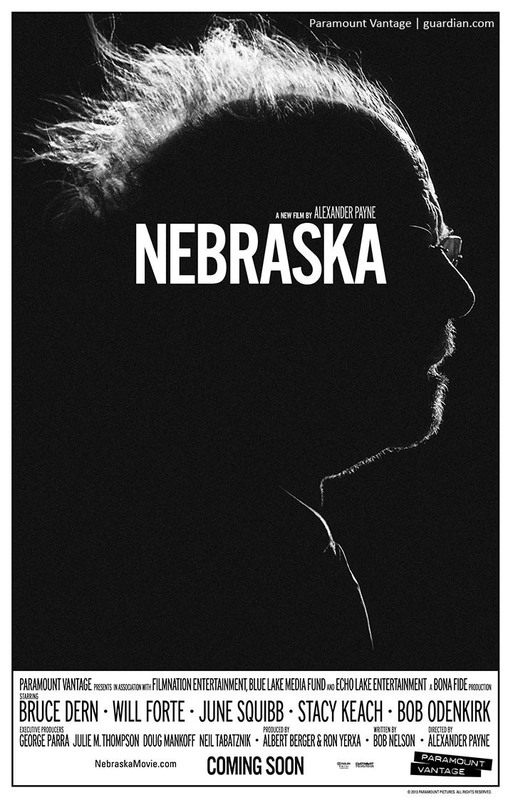 Nebraska was by far my favorite of the Oscar Nominees I’ve seen so far. A fact that surprised me, given that I hadn’t even heard of the film before the nominees were announced. However, Bruce Dern won me over almost immediately and Will Forte was terrific (once I got past seeing him as MacGruber). This film was a perfect example of how a seemingly simple choice – like deciding to film entirely in black and white – can have a huge impact on the whole tone of a movie. Not only is Nebraska filmed in black and white, but it’s grainy – not crisp and clear – and it totally makes the movie. The entire time I was watching I would find myself wondering if the movie would be equally enjoyable in color, and I’m not sure it would. The use of black and white removed any distractions color could have created and instead drove our focus to the performances and the characters. Choosing black and white was a wise decision, this would have been a completely different movie in color. Another aspect I loved about this film was every single member of the cast. No one seemed too beautiful to be true, or super model gorgeous. Everyone in this film felt like a real person, not movie stars playing a part. I could identify with with these people – these people were REAL. I loved that. Then the ending was very understated, and human; it actually brought tears to my eyes – good tears. I really loved this movie. However, I’m not sure it really stands a chance at winning the Oscar for Best Picture. With all the other big budget, shiny films in the category I’m surprised it even received a nomination, but I’m glad it did because I may never have seen it otherwise. Favorite Moment: When brothers David and Ross attempt to take back their father’s long-lost air compressor. This was a great humorous moment with the entire Grant family.